The Piano was invented in 1698 by an Italian, Bartolomeo Cristofori. There are over 12,000 parts in a piano, 10,000 which are moving. There is approximately 18 tons of pressure being exerted by the stretched steel piano strings. In a concert grand, it is close to 30 tons of pressure. The average string having about 160 pounds of tension. There are 230 strings inside a typical piano. The action of a grand is superior in many ways to a vertical piano, one being that any key can be repeated (reset) faster than any vertical upright (regardless of the name given by manufacturers i.e. : upright grand, studio grand, inverted grand, etc.). If all of the strings were of the same thickness and under the same tension, with high C being the usual two inches, low C would have to be about thirty feet long. For this reason, lower strings are weighted by wrapping copper or iron wire around the core wire. The lowest octave having two wrappings. If a piano hammer were attached directly to the back end of a key, when the key was depressed, the hammer would hit the string and stay there, damping out all vibration and sound. For this reason, all piano actions have some kind of escapement mechanism for each key, allowing the hammer to be released from the key just before hitting the string. When the key is released, the action returns to its original position and resets itself for another cycle. Christie's Auction House recently sold a Vicorian Steinway grand piano for $1.2 MILLION DOLLARS! The piano was sold to the Sterling and Francine Clark Art Institute of Williamstown, Massachusetts. 1997 was the 150th Anniversary of his famous Steinway Pianos! Heinrich E came to the States in 1850 at which time he and three of his sons each acquired employment working for four different piano makers. In 1853 he founded Steinway & Sons which is when he Americanized his name (at the time Broadwood pianos was doing well, so he thought it an intelligent marketing decision to anglicize their last name.) He was born in 1797, making 1997 was the 200th Anniversary of his birth. It is also the largest musical instrument (excluding the pipe organ), most versatile and one of the most interesting. with the combined pull of all strings equaling approximately eighteen tons! The total string tension in a concert grand is close to Thirty Tons! That a boxed model D Steinway Grand Piano weighs 1400 Pounds. That six Steinways are now in the Smithsonian collection. The working section of the piano is called the action. There are about 7500 parts here, all playing a role in sending the hammers against the strings when keys are struck. A new piano should be tuned four times the first year, with the change of seasons, and at least twice a year after that. The first practical piano with an escapement mechanism for the hammers and capable of being played softly and loudly was built in 1700 by an Italian, Bartolomeo Cristofori (1655-1731). The Smithsonian in Washington, DC is celebrating the 300th anniversary of the piano with a wonderful exhibit that runs through March 2001. For more information. Cristofori made few pianos, his attention was to the building of harpsichords. The name piano is an abbreviation of Cristofori's original name for the instrument: piano et forte or soft and loud. Spinet pianos were made by Samuel Blythe as early as 1789 at Salem, Mass. The term Grand was first used in 1777. Abraham Lincoln used Chickering Grand #5070 while at the White House. During 1869 the US produced 25,000 pianos valued at $7,000,000, during 1910 production was 350,000 pianos valued at $100,000,000! The famous Steinway pianos that have become the benchmark for well-crafted pianos could have had a completely different name. Henry Steinway changed his name from Engelhard Steinweg after arriving in the United States and starting his own company. While a piano may seem like a simple instrument to operate, it has more than 12,000 parts, 10,000 of which are moving. The extensive number of moving parts is one reason why tuning a piano can be such an involved process. Every piano has a mechanism that moves the hammers back to their original position as soon as they touch the strings. Without this mechanism, the hammers would simply sit on the strings and dampen the sound. In comparison to many other instruments, the piano is relatively new. It was invented in 1698 by Bartolomeo Cristofori in Italy. The piano has earned the moniker “The King of Instruments” primarily for its wide tonal range. The piano can reach the lowest note of the contrabassoon and the highest note of the piccolo. There is no other orchestral instrument that can match its complete tonal range. There are more than 10 million pianos in homes, businesses, and other institutions throughout the United States. A standard piano has about 230 strings, each of which has about 165 pounds of tension. The combined tension of the strings is more than 18 tons. For the concert grand piano, that number increases to more than 30 tons. Piano inventor Bartolomeo Cristofori made very few pianos and instead chose to focus on the harpsichord. 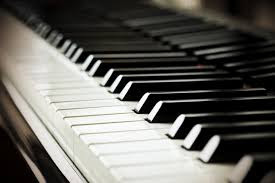 Piano keys were originally made from ivory, thus the origin of the phrase, “tickle the ivories.” This lasted until the 1950s, when cost and environmental concerns caused piano makers to switch to plastic keys. A new piano needs to be tuned at least four times in the first year. Seasonal changes in temperature and humidity will cause the piano to go out of tune. After the first year, it should be tuned twice a year. The term "Tickle the Ivorys" refers to playing the ivory keys of the piano, however, ivory has not been used to make piano keys since about the 1950's (they are plastic, sometimes referred to as "Ivorine"). During the past 100 years there have been approximately 5000 Brands of pianos placed on the market. Most are still on display in homes or elsewhere. Pianos are made of thousands of pieces of wood glued together to form various parts of the playing mechanism as well as the cabinet. Felt, buckskin, paper, steel, iron, copper, and other materials are also used.